Treating advanced cases of dental trauma and decay can require tooth extraction, but this treatment alone cannot restore the health and balance of your smile. 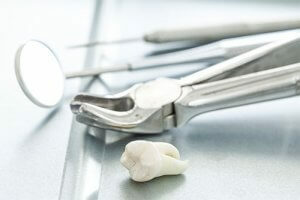 Following an extraction, the underlying jawbone can eventually shrink, resulting in a serious compromise of oral health. Socket preservation is essential because it maintains the health of your entire smile until you are ready to permanently restore your tooth. This supplemental treatment can delay jawbone atrophy, which can in turn delay further tooth loss, misalignment, and other issues that can compromise your smile and your quality of life. Socket preservation acts as an important placeholder, helping you to retain bone mass until you are ready to follow through with a permanent solution. New advances in dental technology have provided a means for many patients to solve the problem of missing teeth, bone loss, and tooth restoration through dental implants. When a tooth is lost, we can replace the tooth root with a titanium post. This replacement fills in the area left void by the original tooth root, thereby eliminating future bone loss. A new replacement tooth is then affixed to the post and the patient’s smile is fully restored. At Prestige Oral Surgery, we strive to provide our patients with the very best standard of care. Preserving as much of the natural structure of our patient’s smiles is an integral part of our job. If you are in need of a tooth extraction, socket preservation can be one of the best investments you ever make in the health of your smile. To learn more about socket preservation and the other advanced treatments we provide to ensure the health of your smile, please contact us today at 732-297-7000.